How did you get attracted to Carnatic music? 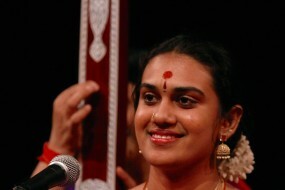 My first interaction with Carnatic music was when I was thirteen. We all went to Madras to the home of Veenai Dhanam. I remember the steps leading up to her house. And she played Pantuvarali. She didn’t say Kamavardhani then. It had been decided that morning in the sadas. Within a few minutes I had tears in my eyes. 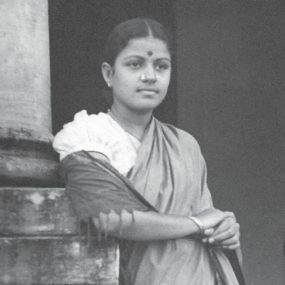 Jayammal and Bala were of course there. Bala was going to join my brother Uday Shankar. She was eighteen then. She came to Calcutta and danced there. Rabindranath Tagore was sitting on the right side in the audience. What a performance that was. I will never forget that. Both the items. You see I got attracted to this Dhanam school, Viswa and his brother Ranganathan who played the mridangam. Whenever I went to Madras I visited them. (He remembers an elderly flute player Bala was very fond of, he said, but couldn’t recall the name). Then I started visiting the Music Academy. 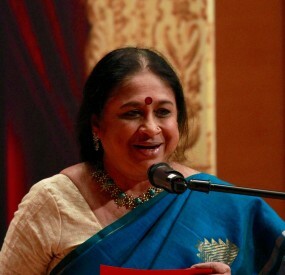 You are one of the few Hindustani musicians with a keen interest in Carnatic music. What sparked your interest in Carnatic music? The first thing to interest me was from the rhythmic point of view. The precision, and the way of training. The fact that everyone starts from the very basic counting, the subdivisions and detailed practice. This affected me very much. We also had it almost on the same level as long as we had dhrupad, dhamar and pakhawaj. Then the whole change came about with the khayal, tabla and sarangi. Which was fantastic! It was more filigree and beauty. It brought forth this beauty and romantic aspect, but what we had in the whole tempo and rhythmic side was given less attention. I was trained in the Maihar (earlier known as Senia beenkar) gharana by my guru Baba Allaudin Khan. It had all the elements of Tansen and Swami Haridas, the old school. In Carnatic music, I found a strange similarity in many approaches. It is commendable the way it has all been maintained, all these songs kept. You can even sing songs of composers who lived 300 or 400 years ago. I was amazed when I saw at the Tyagaraja festival how these compositions had been preserved. That all the musicians could, without rehearsal, sing together exactly the same way. I was delighted because I had some background of our old system in which I was trained by my guru. So I included many ideas in my presentation. From childhood I was very much into Carnatic music and I used to listen a lot. You have used some Carnatic ragas in your music. Are there other aspects of Carnatic music you have adapted? A couple of musicians had already brought some aspects into Hindustani music. Aman Ali Khan who had settled in Poona and another famous Muslim musician Abdul Kareem Khan who was friendly with Kittappa, had some influence. They had already included some elements of Southern music. Hamsadhwani was quite popular already, it was there in our system as part of the Sankara group. The song Laagi lagan pati sun is very similar to Vatapi Ganapatim bhaje. They thus added some beauty to their presentations. I was more into appreciating ragas. I was already attracted to Keeravani, Charukesi, Malayamarutam, Vachaspati. 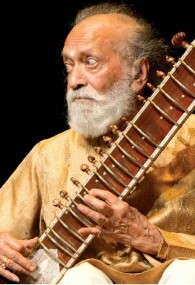 These ragas appealed to me and I began to play them without any fanfare. It was definitely not done by other Hindustani musicians, but now it has become very popular. This thing you call eduppu? I have used that. It was there in our dhrupad-dhamar style but later the whole emphasis moved to the ‘sam’. I took this idea which was still being used in Carnatic music and brought it into my music. I have been an admirer all the time. Today, you have such wonderful young musicians. My friend and my favourite is Balamurali. Musicians who are no more, like KVN, and K.S. Narayanaswami were very good friends. Dr. Narayana Menon, another great friend, got me into All India Radio. We had this group of wonderful musicians from North and South in Vadya Vrinda which we put together. I got very friendly with Ramnad Raghavan, and his brother Ramnad Krishnan. 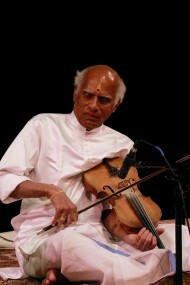 I also brought L. Subramaniam into the group when he was very young and not so well known. It was at the end of 1974 when we toured with George Harrison. I got Palghat Raghu on a tour with my first Festival of India. When you took a raga like Charukesi, did you find some challenges or did it come very easily? I just heard and liked it. It was easier because it was a melakarta raga. I observed that in Carnatic music when they sing it, they treat the notes equally. Like Mayamalavagaula vs. our Bhairav. There is no vadi samvadi in that scale. For us it changes because of this and the chalan. I realised it is not done like that with melakarta ragas. When I heard a raga like Chakravakam, which is the same as our Ahir Bhairav, same as with Vachaspati, I felt free to play it and didn’t have to worry. But I didn’t dare with other ragas, quite common in the South with two of the same notes – where the rishabha is also sung as gandhara. That is quite difficult for us. Are there any ragas you tried that didn’t work? All these ragas where you used the re also as ga. I didn’t touch them. I didn’t try to play them in the Carnatic style. There are many ragas which appeal to me very much, but I don’t try to play them. It is the difficulty in the frets. Let me explain this. We don’t have a chromatic system of frets. We have sa and re. We have these inbetween notes which we shift if needed, but ragas which give us both the rishabha-s are difficult. We have a few like that in Hindustani music. We slide it, it is very difficult. There is a gap. It’s the same with a raga with both the dhaivatas. 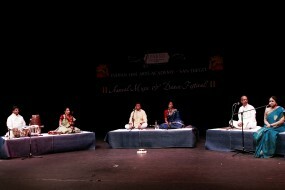 You have been attending a number of Carnatic music concerts in San Diego and sitting through the entire kutcheri. What attracts you to these programmes? Thanks to him. (He points to to IFAASD secretary Dr. Shekar Viswanathan who is seated with us). I find these musicians have expanded their whole presentation. They have taken all the good things from the giants and the great masters of the past who each had their own way. These young people are so brilliant. 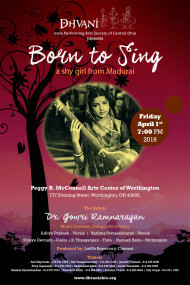 They also have this urge to think of something fresh, without spoiling the characteristic spirit of Carnatic music. It is a very difficult job to keep the source, maintain the tradition and at the same time think of something fresh, of a little different way to ornament it, and bring more beauty to it. I am happy to find this in the young generation. Who are the masters you remember? Veena Dhanam stands out. Tiger Varadachari. I was so impressed by Maharajapuram (Viswanatha Iyer) – I will never forget the Sankarabharanam I heard him sing in the 1940s. I did not get the opportunity to hear his son in person but I appreciated his recordings. I like Ramachandran also very much.